Guided decompression while being productive at the #TheLeisureLodge in Idyllwild (just two hours from Los Angeles). You’ll arrive to Idyllwild and the first thing I want you to do is decompress with a glass of champagne with a beautiful view of the San Bernardino National Forest. I want to hear everything about you, what you do, what you are interested in, how you got there, where you want to go, who you want to be, everything. Is there anything you would like to tell me? Bring a friend and save on the cost. Only $250 each for a Double Package. Ask me for more details. Multi-creatives (aka slashies) that have a hard time bringing it all together. Small business owners who have a hard time marrying personal life with career. Burnt out hustlers who forget who they are and have lost inspiration. I help people figure out what to focus on and the best way to execute based on your personality/skills. My goal is to take all elements of your life (interests, skills, personal life, social life) and figure out how to fuel more business in one actionable plan. Leisure Expert and Personal Brand Coach, Rachel Mae Furman. Now a full-time dweller in the little mountain town of Idyllwild, CA, Rachel has shifted her focus to follow her calling to work with people over products. After two decades of building corporate brands, Rachel now seeks to bridge the gap between personal life and career as a Personal Brand Coach. In following the same steps of brand building, Rachel believes we can manifest the life and career we want through identifying and growing our Personal Brand. In workshops, retreats and one-on-one sessions, Rachel coaches clients to bring all elements of their lives together in one congruent message that identifies a clear path forward. Part life coach, part professional organizer and part energy intuitive, Rachel will apply 20 years of brand building experience to help identify who you are, who you want to be and how to present it to the world. Rachel Mae Furman is a lifestyle specialist in all things leisure and entertaining, from styling to consulting to creating content to hosting retreats and guided "glamping" in her Little White Camper. Her dedication to the pursuit of leisure can be seen on Today Show , and in Create and Cultivate, Daily Scrub, This is Range, Lonny, The Glitter Guide, The Chalkboard Mag, and LA Mag and as a speaker at The Unique Camp. 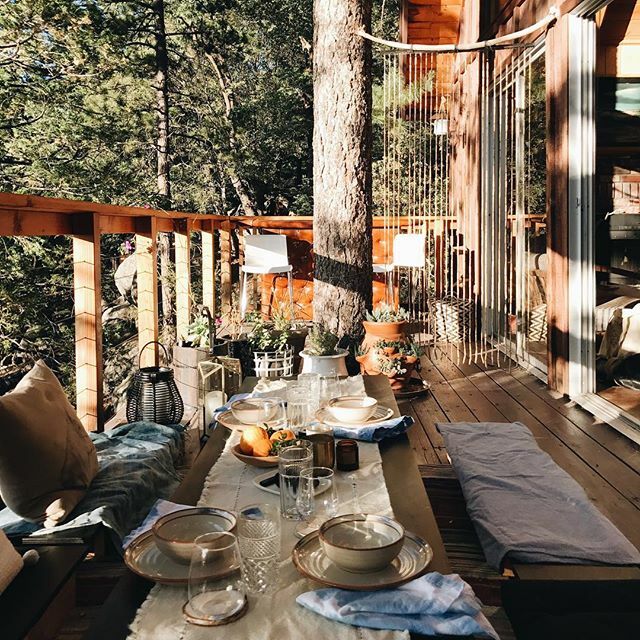 The Leisure Lodge is a cozy 1970s A-frame in the little mountain town of Idyllwild, home to Leisure Expert Rachel Mae Furman and a hub for workshops, retreats and photoshoots. Serving as both a home office and creative studio, the Leisure Lodge provides a modern bohemian style in a mountain setting for LA creatives.